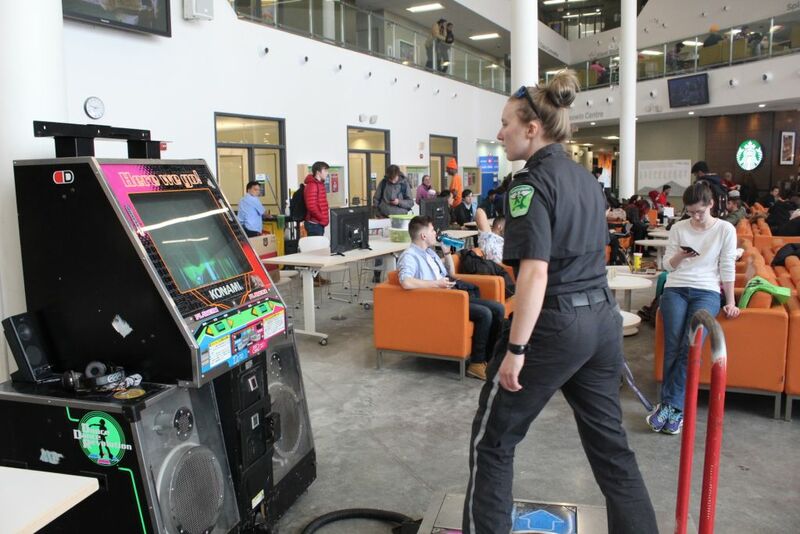 Alison MacKay, 3rd year Paramedic student and member of Algonquin's DDR North Club busts a move at the SA's Retro Gaming Event. The game was afoot in the Commons as the Students Association held its Retro Gaming event on Feb. 9. Partnering with Erin Miklos of Game On Entertainment Service or G.O.E.S. and Alex Perrier, president of Algonquin’s Dance Dance Revolution club DDR North, the Commons was transformed into a makeshift arcade — and no quarters required. Students were able to relive the nostalgia of Contra on the Sega Genesis, Super Mario World and Kart on the Super Nintendo, and an actual Dance Dance Revolution machine provided by DDR North. If the older games didn’t pique your interest, G.O.E.S. provided consoles and games from Mario Kart and Super Smash Brothers on the Nintendo 64, a system released in 1997, all the way to more current generation games like Halo: Master Chief Edition on the Xbox One and Playstation’s Virtual Reality helmet. If you were unfortunate enough to miss your shot at gamer glory, Perrier invites you to one of three video game clubs on campus that meet every Thursday to have some fun and hone their skills in Dance Dance Revolution, Tekken, and League of Legends. Ready player one: old school games appeal to new school gamers Reviewed by Stuart Benson on February 11, 2018 .